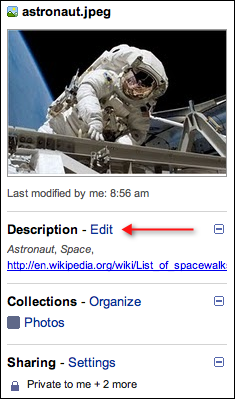 Descriptions also allow you to add clickable links. If it’s important for you to reference a website on an item, simply copy and paste the URL into your description. When the details pane is open, you’ll be able to click the link. A description is a great way to share information about your shared doc or collection to all of your collaborators, or add reference notes about an item. With the added benefit of search, clickable links, and formatting, descriptions become a powerful tool for sharing information and managing your growing documents list. If you have other suggestions for ways you’ve used the description field, please add them in the comments below. You may not have noticed the description field for items in your documents list, but descriptions hold great potential for sharing information and file management. When you have an item selected, you’ll see information about the item in the details pane to the right of your documents list, including a Description section. If you don’t see the details pane, click the double-arrow in the upper right of your documents list to expand it.